We Love Koh Chang approached Hurley wanting to improve their Directory and Hotel Booking website. They were happy with their Branding but felt like their website was dated and thought they would greatly benefit by new having a completely new site built from scratch. 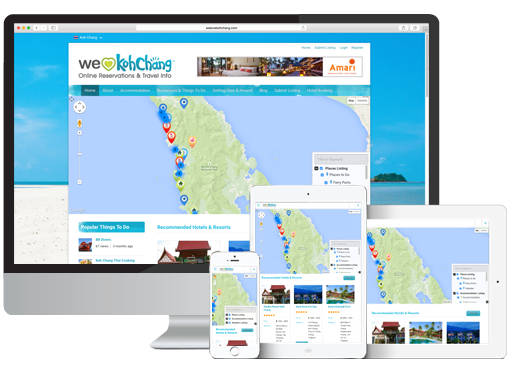 The brief was to design a new directory website which would enhance and complemented the We Love Koh Chang brand. The site was required to have Google Maps and Directions integration for each listing, a user friendly interface which would give the ability for the user to sign up by themselves and upload their own content, with easy upgrade options. The brief also required us to integrate the Paypal payment system as a part of the sign up process. Agoda Partner Hotel Booking was also required to be integrated into the site, keeping consistent with the We Love Koh Chang Branding. We designed the site to compliment and enhance the We Love Koh Chang branding, bringing a fun, holiday feel to the site with professional photography, colour and brand inspired design elements. The layout and functionality for the site was especially important, with the rise of mobile and tablet use online the website was coded with HTML5 and CSS3 using media queries enabling the site to be optimised and responsive to all devices. The layout for the site was another important feature, we designed the site to be clean and contemporary with easy-to-read layouts and typography all complimenting their corporate image. We integrated Google Maps and Direction Maps into the home page, listing archives and listing pages and designed the listing pages to offer an array of CMS features for Business to add their content, such as company logo, image galleries, contact info fields, business description, videos, vouchers, contact forms, Book Now links. We chose WordPress for the CMS platform for this project, WordPress is easy-to-use and the guy’s We Love Koh Chang had used it before and were familiar with the backend CMS features for updating content. WordPress also gave us the ability to utilise the Tevolution Directory plugin which would assist us in integrating the directory listings, monetizing and easy Paypal payments. The plugin also gave us the functionality for businesses to upload their own content, make payment and add a listing to the directory themselves.